Oporto (as it is usually called by English speakers) is the welcoming and historic city which gave its name to Portugal. In its ancient riverside heart, narrow lanes run steeply down to the River Douro, which rises in the north of Spain and empties into the Atlantic Ocean at Foz do Douro. Whoever visits Oporto for the first time immediately feels the characteristic pulse of a city that is not just the regional capital of northern Portugal, but also the main trading centre of the north-west of the Iberian Peninsula. Traditionally known for the Port Wine trade, the region currently hosts a large part of Portuguese industry, notably the sectors of timber, furniture-making, textiles, garment manufacturing, footwear, metal-working and various engineering industries. Its commercial aspect is favoured by such structures as the seaport of Leixões, which carries 25% of the country’s international trade, and the Francisco Sá Carneiro Airport, recognized as one of the best in the world in the traffic category of up to 5 million passengers; its numerous low cost connections to European destinations have brought growing dynamism to the city. The beauty of its historic centre, designated a World Heritage Site by UNESCO, in combination with the modern buildings designed by acclaimed names in architecture like Siza Vieira, Souto Moura and Rem Koolhaas, confers special enchantment on the city of Oporto. The agreeable atmosphere, excellent cuisine, and range of culture and leisure activities at competitive prices, make it one of Europe’s preferred destinations and recipient of praise from such international publications as the Lonely Planet guide and the New York Times. 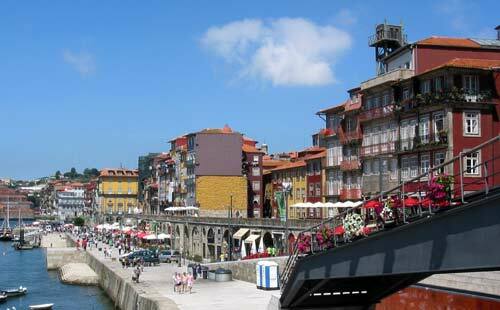 Porto and the many non-historical attractions the city boasts, offer tourists some excellent sightseeing opportunities. Please check some touristic places of interest here.